This is a great salad to serve at Thanksgiving, especially if you're going to a potluck or need to bring a side dish to a gathering. The colors and textures are amazing and it can be served at room temperature so it's great for a buffet table. I dressed this salad with a Pomegranate Vinaigrette using a pomegranate syrup purchased at a Middle Eastern market. If you can't find pomegranate syrup you can either make your own by reducing unsweetened pomegranate juice, or use another vinaigrette altogether like apple cider or even lemon. In a small sauce pan, add wild rice, 1/2 tsp kosher salt and filtered water to cover rice by 5". Bring to a boil and then reduce heat to medium-low and cook rice for about 40-50 minutes until kernels have softened and are starting to puff open. You may need to add extra water as rice cooks. Drain rice and rinse under cold water and then drain really well again, using a spoon stirring the rice to make sure most water has drained. Place in a bowl and set aside. Heat a medium sauce pan on medium heat, add olive oil and couscous and toast until lightly golden brown, stirring constantly. Add 1/2 tsp kosher salt and filtered water to cover by 5". Bring to a boil, reduce heat to medium-low and simmer for about 10-15 minutes until couscous is tender. Drain couscous and rinse under cold water and then drain again really well, using a spoon stirring the couscous to make sure most water has drained. Place couscous in the same bowl as the wild rice. Fill a small sauce pan with water, add some salt, bring to a boil and add diced butternut squash and cook for about 2 minutes until crisp-tender. Drain immediately and place in an ice bath to stop cooking. Drain really well and pat dry on paper towels to remove excess liquid. Add to the wild rice and couscous mixture. 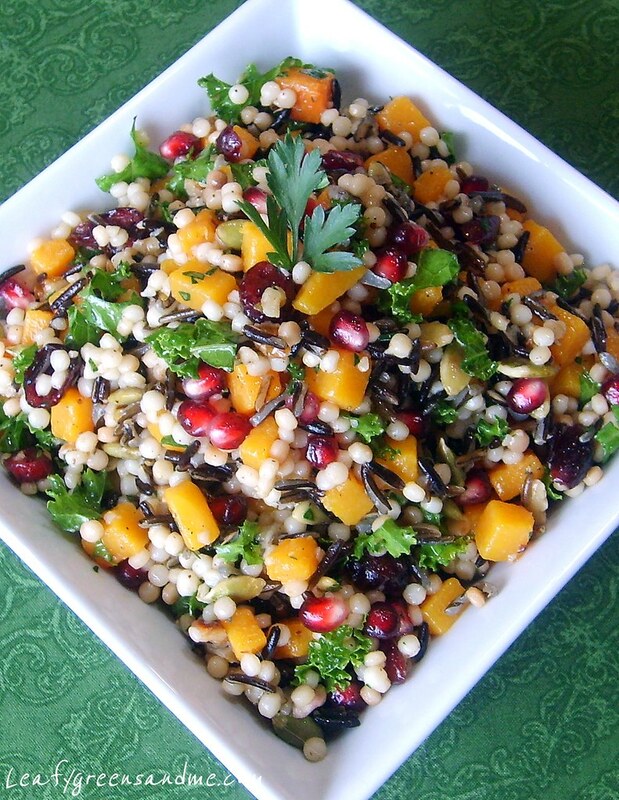 Add toasted walnuts, pumpkin seeds, pomegranate seeds, chopped kale leaves and minced parsley and stir to combine. Start off by adding a 1/4 cup of the vinaigrette, along with kosher salt and black pepper to taste and stir well to combine. Place salad in the refrigerator for about an hour for the flavors to combine and just before serving, add additional vinaigrette and salt and pepper if needed. As the salad sits, the couscous will absorb the vinaigrette so you may need to add more. Place ingredients in a bowl and whisk in olive oil. If too tart, add a little agave syrup or more olive oil if desired.